Phone Yodel for free on their freephone number 0800 157 7777 to contact a customer service advisor, to track a parcel delivery, for package price enquiries and for courier complaints. Contact Yodel on their main customer service phone number 0844 755 0117 to get their parcel price rates, to notify them that you will not be in on the scheduled delivery date and to upgrade to next-day delivery. You may also phone this helpline to confirm that a payment has gone through and for technical support when using their online service to track a parcel delivery. Moreover you can phone this number to check where your nearest depot is so that you can pick up a missed package delivery. Similarly if you are unsure of your nearest collection point you can call this helpline to confirm their locations so that you can make drop-off deliveries as well as collect an online order. Calls to the Yodel customer service phone number 0844 755 0117 are charged at 1p per minute plus the standard network access charge which is set by your provider, therefore calls from mobiles may cost substantially more than calling from a landline device. You can phone Yodel from 8am-7pm Monday-Friday and 9am-1pm Saturday, therefore be aware that you will not be able to contact them on Sundays as well as UK bank holidays. Contact YodelDirect on their customer service phone number 0844 755 0117 to manage your regular parcel deliveries, to upgrade to a comprehensive business package and to check their rates for regular parcel senders. You can also phone this helpline for premium next-day deliveries where one of their couriers can pick up the item from your home address for your convenience. Furthermore you can request details about their bulk shipping tools which are designed to assist customers who regularly send parcels through popular online retailers such as Amazon and eBay. Contact Yodel from outside the UK by calling their international phone number +44 844 755 0117 where you can manage an overseas parcel deliver and track your package from abroad. Moreover if you need to make an emergency delivery for a wallet or passport you can call this helpline to check their international postage rates and affiliated delivery partners. Calls to Yodel from overseas will cost more than the equivalent UK call and the exact rates will vary depending on which country you phone from so please confirm with your provider before making the call. Contact Yodel to track a parcel delivery by calling their freephone number 0800 157 7777 for free where you can check the estimated time of arrival, updates on traffic information which may affect when your package arrives and to report a missing parcel. Please note that you will only be able to use this service if you have a Yodel account card or a tracking number therefore you will not be able to use this automated helpline if you have not booked a delivery. You can reach Yodel in using methods other than their telephone numbers including via their postal address, email accounts and via their profiles on social media websites. You can write to Yodel customer services by sending letters to their Liverpool head office address which is provided below for your convenience, however you should call them for urgent enquiries instead as this is a fairly slow way to communicate with the parcel delivery company. 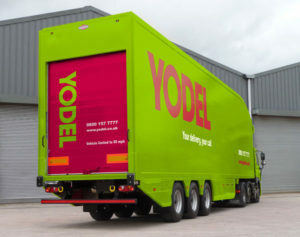 You can send an email to Yodel by going to their contact details website where you can also find links to have a web chat with live advisors, helpful FAQs and online parcel tracking tools. Yodel handle public enquiries about their parcel delivery services via their social media platforms where they also promote their competitive price rates and provide advice when sending a package with their couriers.